This is a series of x-rays of the esophagus, stomach, and the first part of the small intestine called the duodenum. 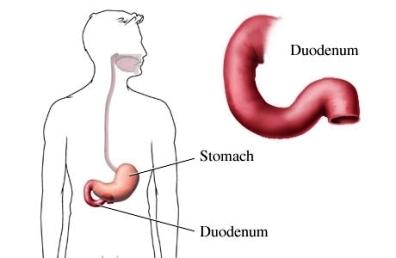 Together, the esophagus, stomach, and duodenum are called the upper gastrointestinal (GI) tract, or upper digestive system. The x-rays are taken during and after drinking contrast material called barium. The barium solution is a thick, white, chalky, milkshake-like liquid. It coats the inside lining of your GI tract. This makes the GI tract show up better on the x-ray. Some people may have an allergic reaction to the barium or have difficulty keeping it down. As with all x-ray tests, make sure you let your doctor know if you are pregnant. Talk to your doctor about the medication you are taking. They may need to be adjusted before the test. Do not eat, drink, or smoke for at least 8 hours before the test. You may be given a medication called glucagon. This will slow down the activity of the stomach and small intestine. You may be asked to swallow baking soda crystals. These crystals will bubble and make gas in your stomach, allowing for x-rays that are more detailed. If the doctor wants to look at lower parts of your intestine, you may need to take a laxative the day before your exam. This will clean out your intestine. You will remove all jewelry and wear a hospital gown. You will drink the barium solution. As you drink the barium, the radiologist will take x-rays of your chest and abdomen. The doctor may also give you bits of food to eat with barium on them. You may have to change positions frequently during the test. If your doctor wants to look at more of your intestines, a small bowel follow-through may be done. This means that x-ray pictures are taken every 15-30 minutes while the barium travels further down the intestines. You may eat and drink as usual. Drink plenty of fluid. The barium will slowly pass through your system on its own. You may have some white-colored stool or constipation after the test. An upper GI series can take 30 minutes-2 hours. A small bowel follow-through can take 1-4 hours. A normal upper GI series will show a functioning, healthy digestive tract. Your doctor will perform further tests or make a treatment plan based on the findings. Patient prep & instruction manual. Scheduled test: upper GI series. Penn Medicine website. Available at: http://www.uphs.upenn.edu/radiology/patient/docs/Upper%5FGI%5FSeries.pdf. Accessed April 4, 2018. Upper GI series. National Institute of Diabetes and Digestive and Kidney Diseases website. Available at: https://www.niddk.nih.gov/health-information/diagnostic-tests/upper-gi-series. Updated August 2016. Accessed April 4, 2018. X-ray (radiography)—upper GI tract. Radiology Info—Radiological Society of America website. Available at: https://www.radiologyinfo.org/en/info.cfm?pg=uppergi. Updated April 1, 2017. Accessed April 4, 2018.